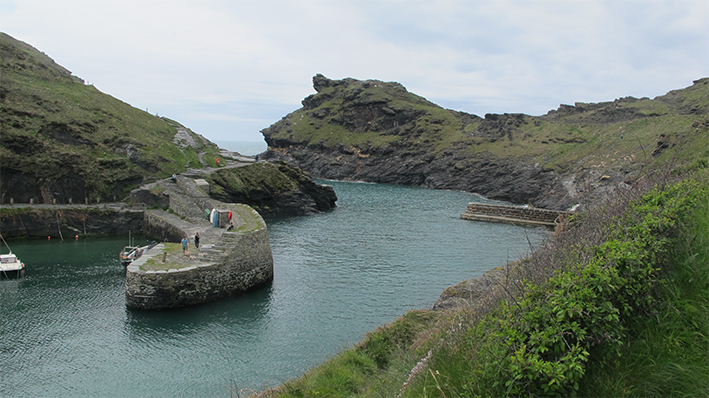 Visiting Tintagel and Boscastle provided many visually rewarding ideas for a Cornish Coast mug to add to our British Coast Series. 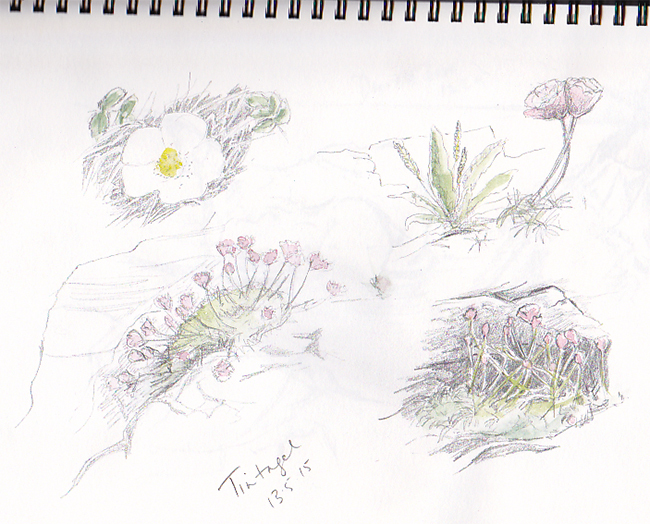 Firstly, at this time of year especially, I enjoyed the many varieties of wild flowers that seem to be able to cling onto the salty cliffs and provide a great spring display. Up close there is an infinite variety in their shape, colour and form and how they interact with their surroundings; daisies contrasting with a turquoise blue sea, cushions of pink thrift taking advantage of stoney crevices. Secondly, catching my eye were the textures of the solid stone forms and the flexible movement of the water surface. 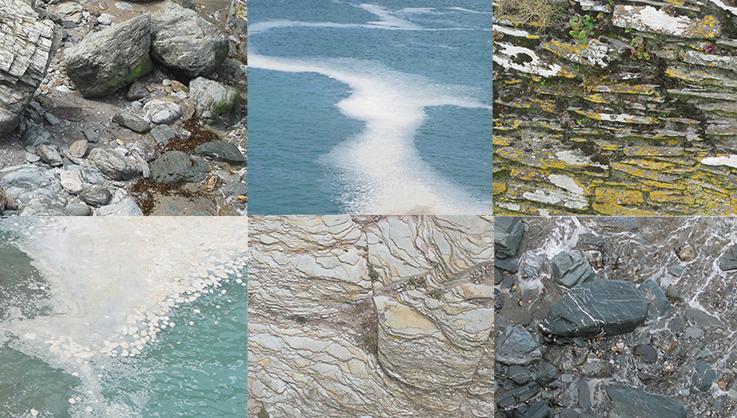 Bubbles and flows of white water patterned the blue while colourful slate had been weathered into a iridescent mother of pearl at the top of the headland. Organised slate built walls with horizontal stripes of bright yellow lichens contrasted with the sea smoothed boulders on the little beach. 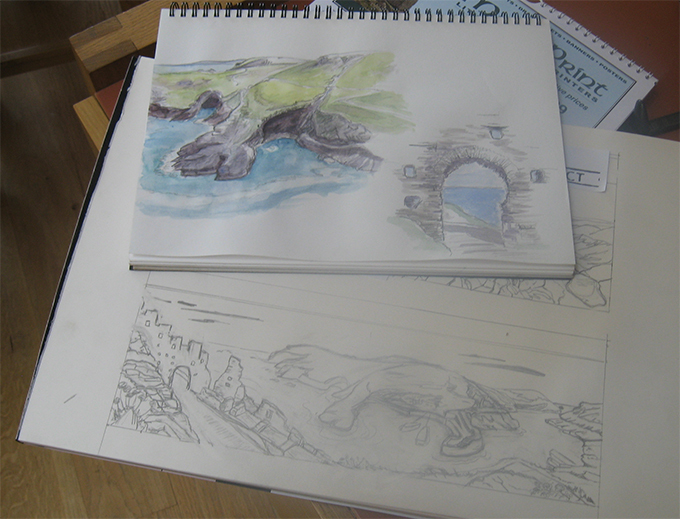 Doorways, arches, windows and walls makes the structure of Tintagel a fascinating subject for sketches and photography. 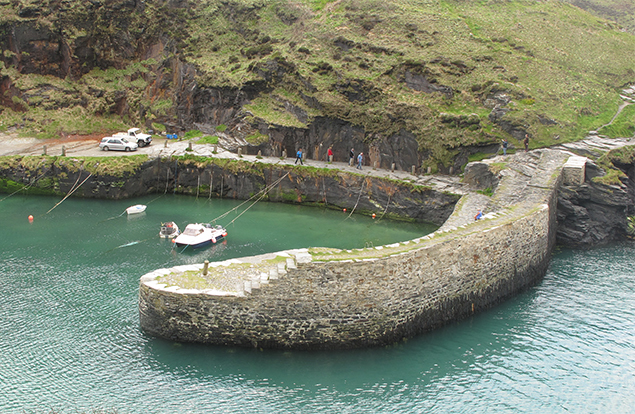 At Boscastle the arm of the harbour wall makes a grand sweep up onto the coastal path and out of the river mouth towards Tintagel. The snaking structure gives a lovely image to work with for the reverse of the mug. Next step; to move my sketch to the lino and start cutting. I love this part as you get closer to the spontaneity of the printed result.